At last! Ruby and Java together! What a magic combination! I've been a Java application developer for a decade now, and my Perl and other scripting activities have almost always been a completely separate activity. Although I tried JPython a few years ago, and it was fun and productive, it didn't stick. But now I've tried JRuby and got far more done preparing this snippet than expected, so I'm definitely impressed! The second item in this talks title is JFreeChart. 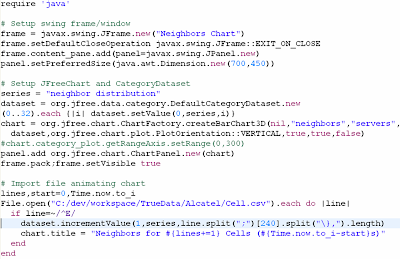 This arose from a need to add charting capabilities to the user interface of our pure java application. 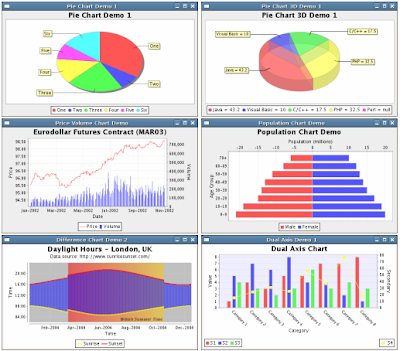 While it took me over two hours of Internet searching and reading of descriptions and reviews to find JFreeChart, it took only a further one hour to add the necessary charts to our application. Considering that this hour included trying out some of their demo code, and reading some basic JFreeChart documentation, I was amazed at how quickly it was possible to code for this amazingly complete charting library. OK. It is a bit longer than most ruby snippets I usually like to present, but it is very easy to read, with three sections clearly separated by comment lines. 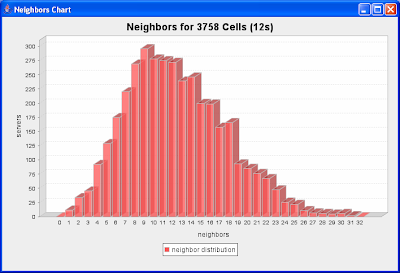 The first sets up the required application swing components, the second prepares the JFreeChart chart and dataset, and the third is the actual plain ruby code for reading the telecoms switch data file, parsing it and adding the relevant statistics to the chart, while conveniently modifying the chart title dynamically. As usual, the same application in pure java is at least three times as many lines. My final impression:- Ruby is a lovely language, and Java is the industry standard platform with the widest 3rd party library support, and this combination is absolutely a killer combination. So although I started this talk with the idea of adding ruby scripting to java applications, I'm now thinking more of writing Ruby applications that simply use Java libraries. And of course, I can't wait to try Rails on JRuby! Have you tried Rails with jRuby yet? Specifically, using JFreeChart with jRuby on Rails? I'm a noob when it comes to both Java and Ruby, so I'd be interested in any examples you may have using JFC/jRoR. Sorry for the slow response, I had not enabled notification for comments on this blog. And sorry again, I have not tried Rails on JRuby. I have always used the standard ruby with my rails apps. This is also partly due to the fact that I've done no JRuby since this first trial. I am scheduled to do a lot of JRuby in July, so perhaps this will change. But I could also comment that since rails is a server-side framework, I'm not sure I see the value of GUI libraries like JCF/Swing/JFreeChart in rails. You can use JFreeChart to generate your chart, create a JPEG or GIF image of it, then and serve it using a (j? )RoR app. No? I've still not used JRuby with Rails, but I have used normal Ruby on Rails and JFreeChart in many Java contexts, and can see no reason why it should not work great for JRuby on Rails. What I have used for Ruby on Rails is one of the many Flash based charting options, mainly because I liked the client side interactivity and higher print resolutions.